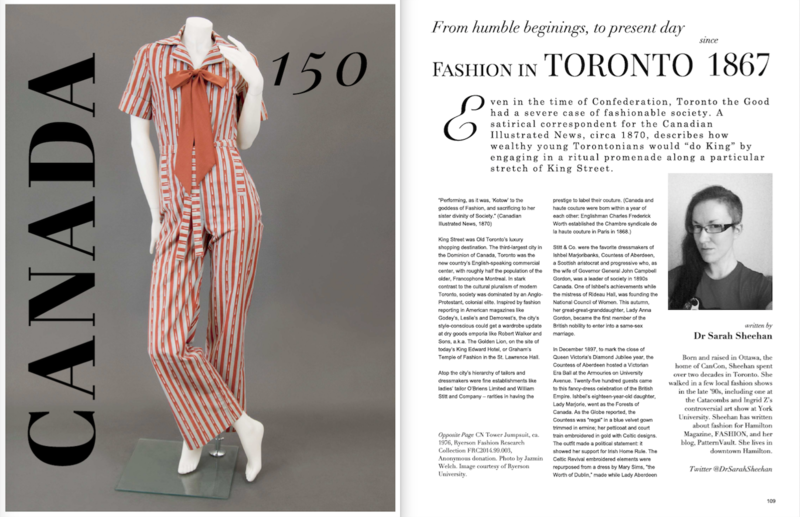 I wrote about Toronto fashion history since 1867 for FORWARD Magazine, a new glossy edited by Ugyen Wangmo. For this Canada 150 sesquicentennial feature, I sourced vintage and archival images from the 19th and 20th centuries — in the process rediscovering some forgotten Karsh portraits of the couturière Madame Martha. Thanks to everyone who generously responded to my queries: Marilyn Brooks, Comrags, Cynthia Cooper, Enzo DiMatteo, Samuel Engelking and staff at NOW Magazine, Julie Grahame for the Estate of Yousuf Karsh, the family of Claire Haddad, Faye Hammill, Janice Helland, Ingrid Mida, Chris Nicholls, and Dale Peers. Published quarterly by FORWARD Fashion Toronto, FORWARD celebrates diversity and progressive fashion in the GTA.